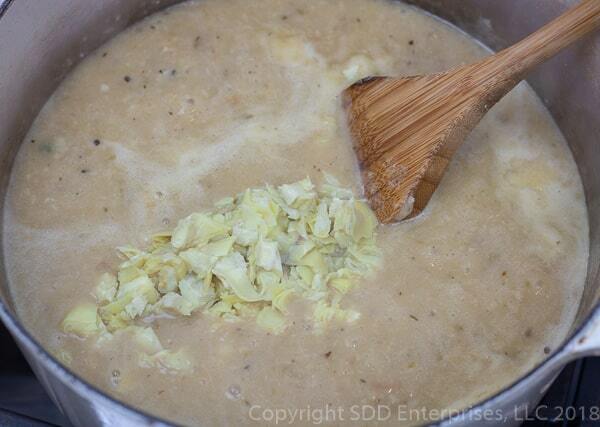 The first time I ever had Oyster Artichoke soup I was blown away! It was years ago at one of my favorite New Orleans restaurants, Mandina’s on Canal Street. 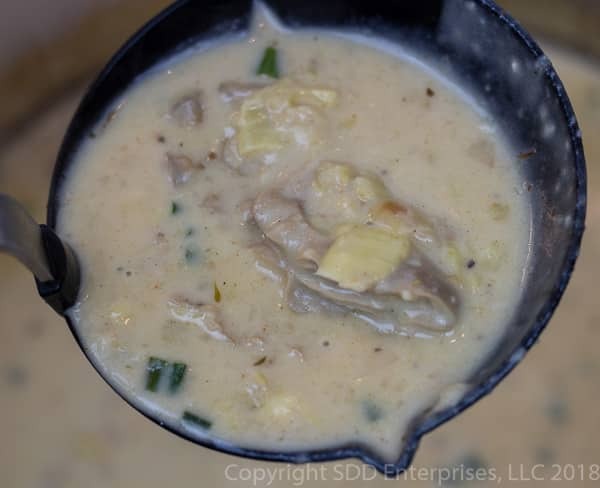 It quickly became a favorite of mine…fresh oyster and artichoke in a creamy soup…what’s not to love?? 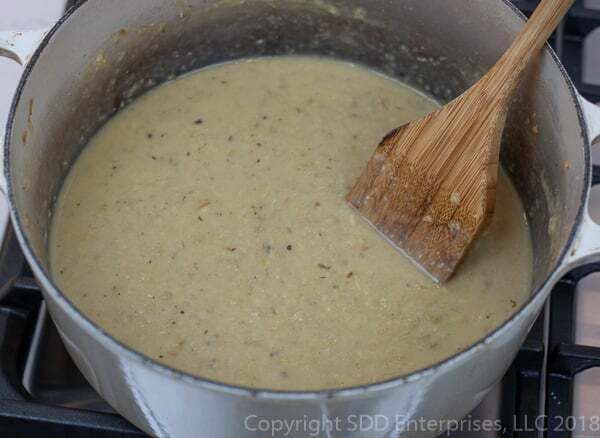 It’s not often that the origin of a Cajun or Creole classic can be traced definitively to its creator, but the Oyster Artichoke Soup was originally created by the late Chef Warren Leruth of the world famous LeRuth’s Resturant in Gretna, across the river from New Orleans. Sadly both Chef Leruth and his world-class restaurant are gone, but Oyster Artichoke Bisque has become a staple of Creole cuisine and New Orleans restaurants. Its all about fresh Gulf oysters and artichokes. Fresh raw oysters and their natural juice (oyster liquor) bring a wonderful seafood kind of briny flavor. Of course, I am partial to fresh Gulf of Mexico oysters but I have had some wonderful bivalves from the Chesapeake Bay waters of Virginia and Maryland and many other east coast areas and they would be great in this recipe also. The artichoke flavor is unique and somewhat complex in my opinion. Definitely on the mild end of the vegetable spectrum, often compared to asparagus, but to me that only explains that artichoke has a unique flavor like the asparagus has a unique flavor-there aren’t many comparable tastes to either of them and no-one will confuse the two. 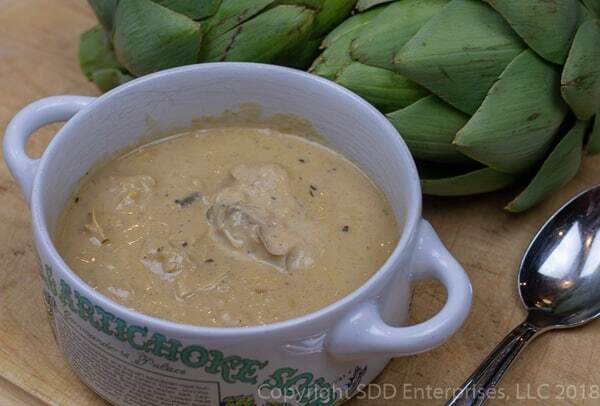 For this bisque, the artichoke flavor will come from artichoke bottoms and artichoke hearts which are available canned, just make sure to get them packed in brine or water, not marinated. We don’t want to add additional flavors, just pure artichoke. We’ll start everything off with butter and the Holy Trinity-that’s yellow onions, green bell peppers, and celery. Of course, we need some garlic and green onions. This will all ride in a soup made from chicken stock, thickened by a light roux of butter and all-purpose flour and some heavy cream. Creole seasoning and white pepper add some spice. The oysters and creole seasoning (depending on what brand you use) may provide enough salt, but have some Kosher salt handy just in case. Equipment wise you’ll need a small food chopper or processor and a heavy bottom dutch oven. 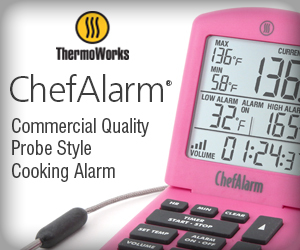 You’ll definitely need some beer for the cook on this one! First…you have a beer. Making Oyster Artichoke Bisque may seem complicated before you tackle it, but it really is pretty simple if you’re in the right frame of mind. We’ll make this no-angst by doing some mise en place and having everything prepped and ready. Take a swig of that beer, read the recipe completely and make sure you have all the ingredients. Break the process into three parts: prepping the oysters and vegetables, cooking the vegetables and roux and finally simmering the bisque with the oysters. The oyster liquor is a major flavor contributor to the bisque, so you want to collect as much as possible. 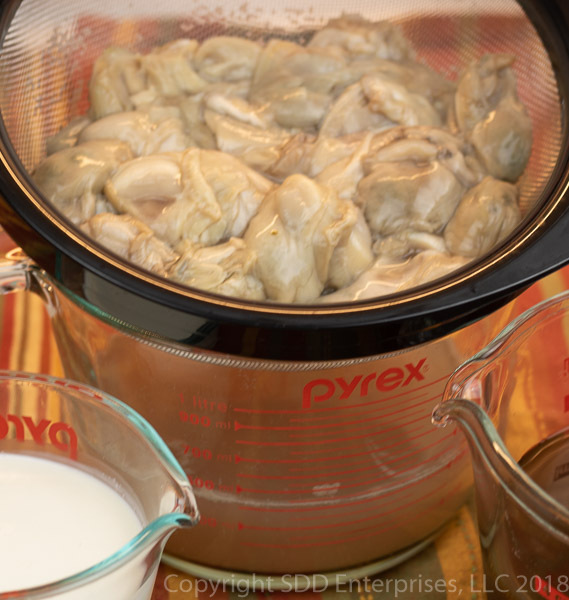 The oysters will come in a jar or container with their juice, so place a strainer over a wide measuring cup or bowl and dump the oysters right in the strainer. The juice will filter through the strainer, so just stick it in the fridge and let it drain until you need it. It will continue to drain for quite a while. 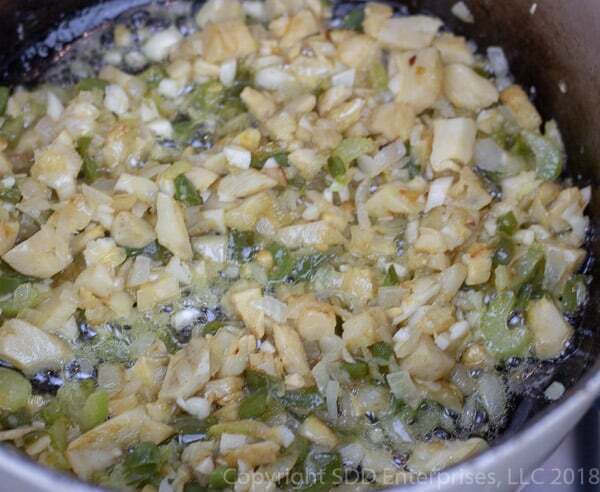 Chop the yellow onions, bell peppers, celery, garlic and artichoke bottoms and place them in a bowl together. We’re going to run those through a food processor later, so no need to go nuts with the chopping. 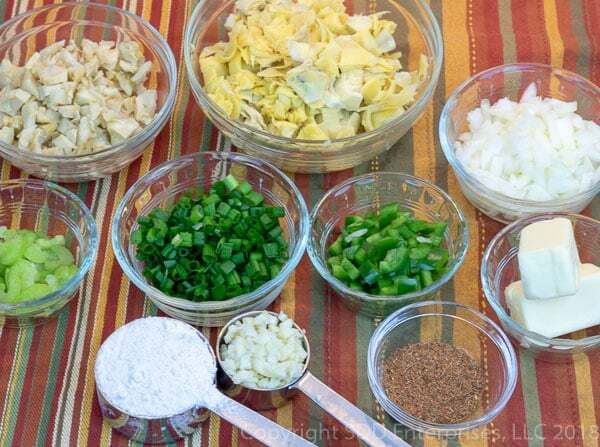 Chop the artichoke hearts and the green onions and place each in their own bowl. Measure out the creole seasoning, white pepper and heavy cream. Have the chicken stock handy but no need to measure it out until you see how much oyster liquor you get, you’ll adjust the amount of chicken stock based on the oyster liquor to get a total of 5 cups of liquid. Two pints of oysters should provide about 2 cups of juice, more or less, so you’ll add 3 cups of stock to make 5 total cups of liquid. 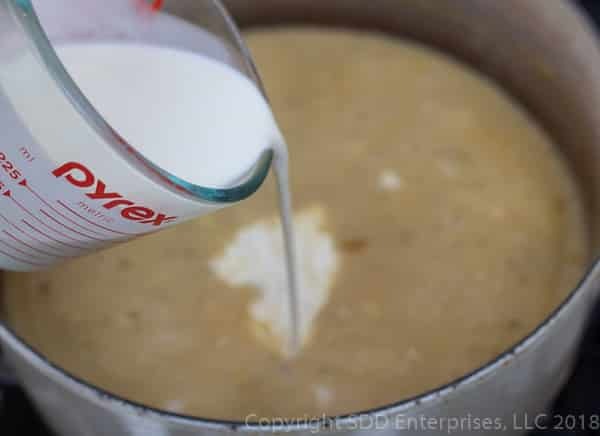 Melt four tablespoons of butter in a heavy bottom dutch oven over medium heat until its foaming. Sauté the chopped artichoke bottoms, onions, green peppers, celery and garlic until the onions are clear and everything is starting to brown a little, stirring often. 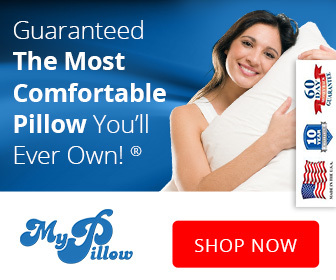 This will take 15 to 20 minutes. 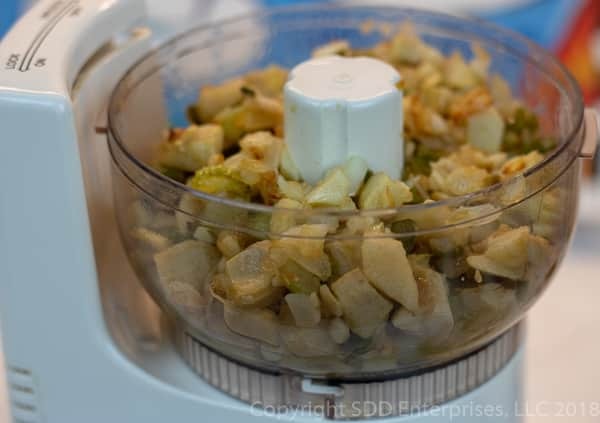 Remove the vegetable mixture with a slotted spoon to a food processor and purée it. Let the pureed vegetables sit in the processor while you make a light roux in the same dutch oven by melting a stick of butter and adding the all-purpose flour. 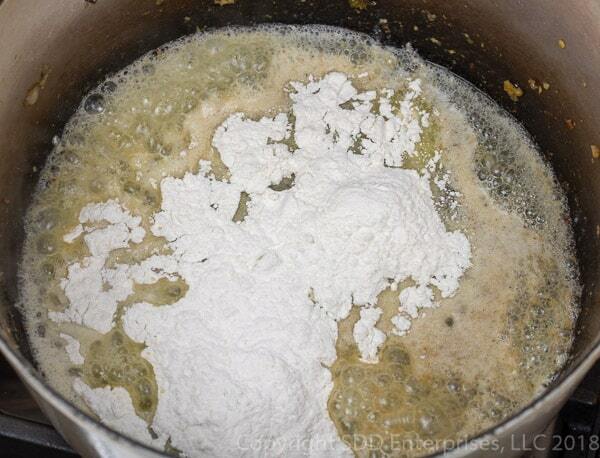 Keep things moving over medium heat until you have a nice light roux. You don’t want it to brown very much but it will take about 5 minutes while the flour taste is cooked out. 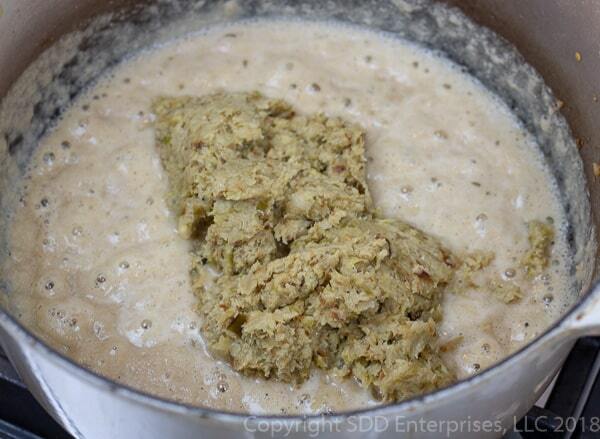 Add the pureed vegetables to the roux and thoroughly combine it all. 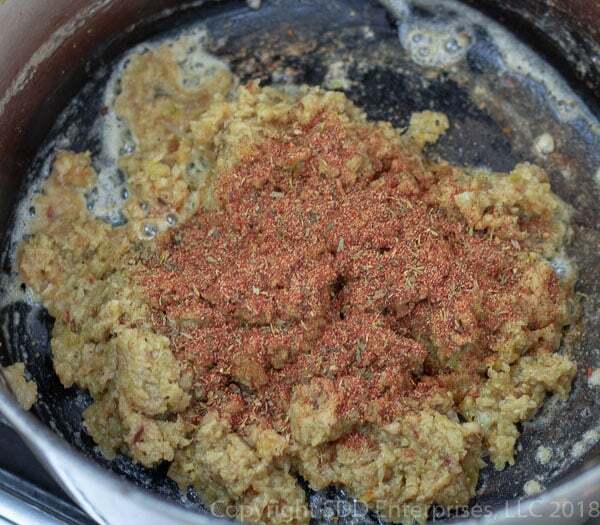 Once its all mixed together stir in about half the creole seasoning and white pepper and continue to simmer about 5 minutes more, stirring it often. Does this look good to you? Sign up for my email notifications of new recipes and posts right HERE. Take the oyster liquor you’ve been accumulating and pour it into a large measuring cup. Leave the strainer over the original bowl and return it to the fridge as the oysters will continue to drain: we will use that extra oyster liquor later. Confirm how much oyster liquor you have and add enough chicken stock to make five total cups of liquid. Give it a stir and start adding it slowly to the vegetable/roux making sure to mix it all thoroughly before adding more liquid, we want a smooth bisque with no lumps. Once about half of the liquid has been added in this manner, add the rest and stir it all together until smooth. Next, mix in the chopped artichoke hearts and simmer the whole thing for 15 to 20 minutes, uncovered. Blend in the heavy cream keeping a constant simmer for another 5 minutes. At this point add the oysters a few at a time, stirring well in between each addition. Don’t forget to add that extra oyster liquor that’s accumulated! Add the green onions, the rest of the Creole seasoning and white pepper and stir it all together well. 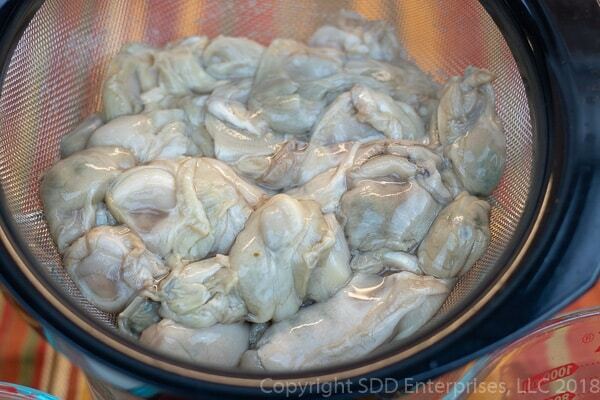 Simmer for about 5 more minutes until the oysters are curling up on their edges. Check it for seasoning but remember the oysters, Creole seasoning and even the stock will have salt, so taste the bisque before you add any kosher salt. Now cover the dutch oven, remove it from the heat and let it sit for about 15 minutes while the flavors continue to meld and you get everything ready to serve. How about a nice salad and some crispy french bread? That’s it, simple as that! Collecting the oyster liquor is a key step in this recipe. 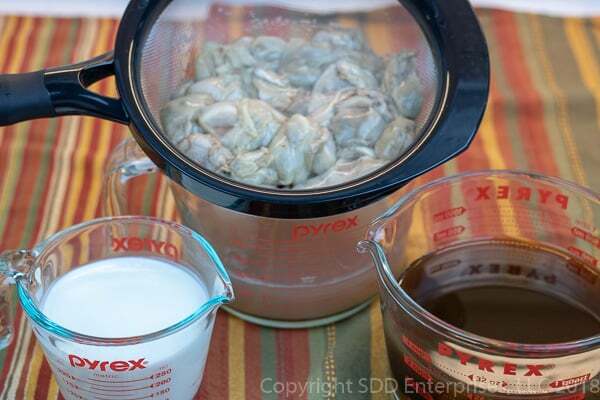 To drain the oyster, place a strainer or small colander over a 4 or 8 cup glass measuring cup. Pour the accumulated juice into another vessel to add the stock, but make sure to keep the oysters in the strainer and place that back over the original measuring cup. Return it to the refrigerator (you want to keep the oysters cold) and they will continue to drain. 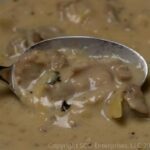 It seems like they could drain forever, but it’s all good…you’ll add that extra oyster liquid into the bisque when adding the oysters and you want as much as you can get. Add the oysters near the end of the process. They don’t take long to cook and can get a little rubbery if cooked too long. Be careful adding salt. Oysters come from salt water, so they can be pretty salty while many commercial creole seasonings and stocks also contain a lot of salt. 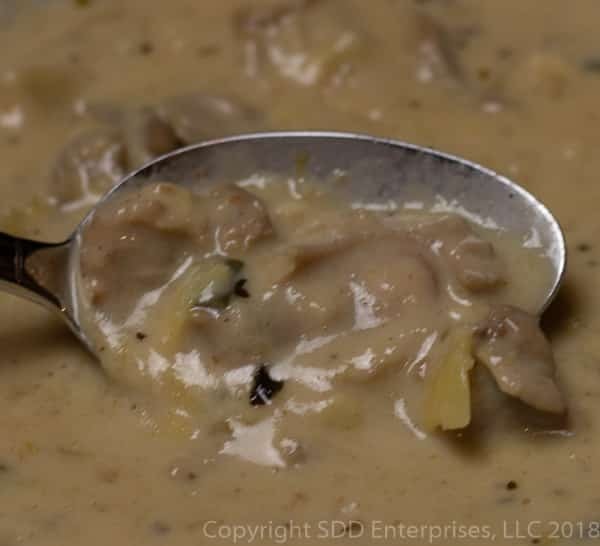 Make sure to taste the bisque after the oysters have simmered for about 5 minutes, then add kosher salt to your liking. When making any gumbo, soup or bisque, you’ll get a better result if you use stock instead of just plain water. Homemade stock is great because you can control what goes in it (like salt! ), but there are a lot of commercial stocks available that bring just the right flavor. Water, not so much. Check out some recipes for homemade stock below. You can substitute vegetable stock or seafood stock for the chicken stock, but I really don’t recommend it. Chicken stock is mild but flavorful and won’t overtake the oyster juice. I have found when using vegetable stock in this recipe the final dish lacks some of the depth of flavor that chicken stock adds and seafood stock can somewhat conflict with the oyster liquor. Substitute if you have to but if you can’t find any chicken stock in the grocery store, you can always grab some at Amazon right here. A pint of oysters should be between 12 and 18 oysters, maybe a few more, depending on their size. If you have fresh oysters available, use about 3 dozen freshly shucked oysters with their liquor. Check your local seafood purveyor to see if they have some fresh oysters in a jar, or you could check with the Cajun Grocer (cajungrocer.com) and get some fresh Louisiana oysters sent to you. I have no affiliation with Cajun Grocer but I want you to have access to the best! Artichoke hearts and bottoms are available in cans, just make sure they are packaged in brine or water and not marinated in oil and spices. It’s also common to find artichoke hearts and sometimes bottoms frozen and they are usually very good. If you think this sounds good, make sure you sign up for our email notifications of new recipes and posts right HERE. 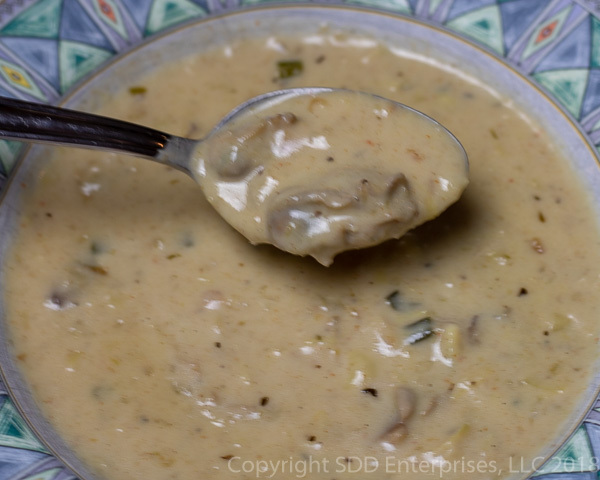 Oyster Artichoke Bisque-doesn’t that look good?